During a marriage or registered domestic partnership, a couple may acquire many things together, including money, property, children, businesses, investments, retirement accounts, debts, credit cards, etc. The longer a couple is together, the more likely they are to acquire more of these things in greater amounts. If, as many couples do, they decide to go their separate ways in a divorce or a legal separation, all of the things that were acquired during the marriage or the registered domestic partnership will need to be divided between them. This means that children will spend time with one or both parents, depending on the best interests of the child, businesses may be sold or one partner may buy out the other, property needs to be valued and divided, and homes may need to be sold or bought. 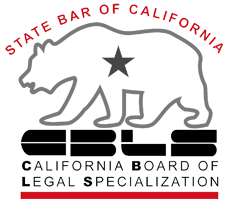 When debts, assets, and property are divided in California, the division is done according to Community Property Law. This means that only the debts, assets and property that are considered to be community property, or those things that belong to both spouses, will be divided. Separate property already only belongs to one spouse, and that spouse will keep it. 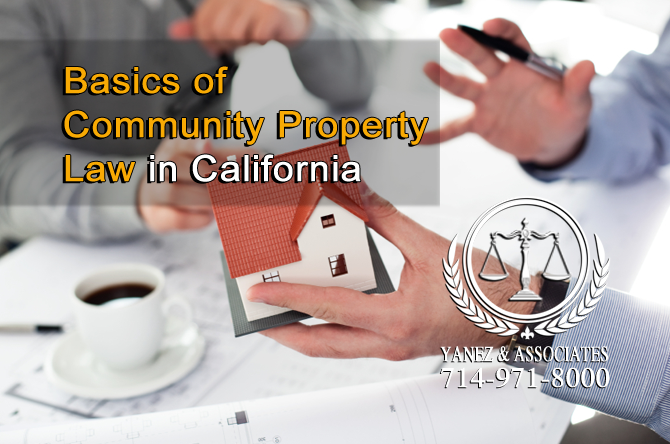 What are the Basics of Community Property Law in California, I should know? Community property law dictates how property, debts and assets are divided in a divorce or legal separation in California. First, the law requires that all property, debts, and assets that a couple owns be separated into two categories: separate property and community property. Separate property is everything that a couple owns but does not share. This includes things that either party owned, owed, or earned before they were married. It also includes things that either party owned or earned, or debts that were acquired, after the date of separation. It also includes any gifts or inheritances that either party obtained at any time, before, during or after the marriage or registered domestic partnership. Separate property also includes anything purchased with separate income, which is income that was earned outside of the dates of the marriage or registered domestic partnership. Community property is everything that a couple owns together, including earnings or property purchased during the marriage or registered domestic partnership and until the date of separation, excluding gifts and inheritances that were given to one spouse. Community property also includes anything purchased with community income. The date of separation can sometimes be difficult to determine. Officially, a couple separates when they are no longer sharing a space, and when one of them has officially decided to file for a divorce. This can happen when one partner moves out of a shared home, or when they both live in separate rooms within the same home, as long as one partner has decided to file for a divorce. Once categorized, anything that was put into the ‘community’ category will be divided equally between the two spouses or partners. Division can be done in or out of a courtroom, but in order to be legally enforceable, a property division order needs to be approved and signed by a judge. Remember that property includes everything that you own together, including cars, your home, furniture, clothing, appliances, etc. 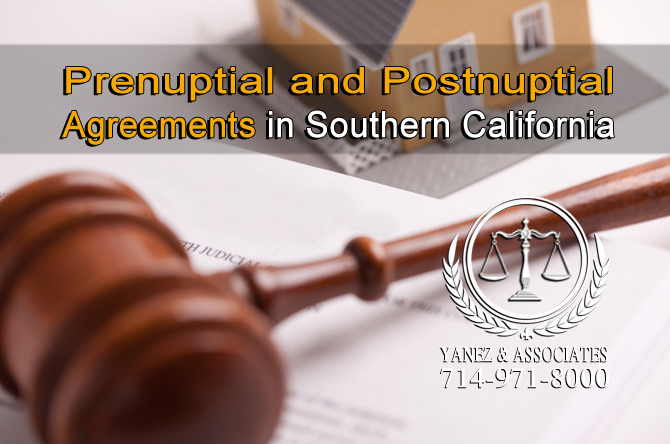 What should I know about Prenuptial and Postnuptial Agreements in Southern California? If you and your spouse or partner signed a prenuptial agreement before you were married, or a postnuptial agreement after the marriage began, the rules for dividing property in your divorce or legal separation may differ from the basics of community property law. Always contact an attorney during property division, but especially if you are dealing with a premarital agreement or a postnuptial agreement. Prenuptial and Postnuptial agreements can alter what either spouse will walk away from a marriage with in the case of a divorce. What should I know about Dividing Community Property in Orange County CA? Once it has been categorized as community property, your property must be divided between you and your spouse or partner. To do this, property is usually valued and divided according to value. Sometimes, when a couple separates, they will each take a car, some of the furniture, and may even each have their own pension plans, However, according to California law, if any of these items are considered to be community property, they will need to be valued and divided in a divorce or legal separation. Determining the current value of certain property can be simple, while valuing other property, like a house, can be more complicated. Items are valued according to ‘fair market value’, which means that the value of the item in your divorce is the same value that you would get for it if you sold it right now, as it is. Real estate professionals can help value your home, or, you might want to have a formal appraisal. The best way to begin dividing property, assets, and debts in a divorce or legal separation is to make a list of all of it. You will need to categorize all of it as either community or separate, place a value on everything, and make sure to include all of it. In order to finalize your divorce, you need to fill out a form called a Schedule of Assets and Debts, which requires you to do this anyways. It is best to have an attorney help you with this process, because there can be harsh consequences for inaccuracies. A schedule of assets and debts needs to be filed by both parties, filed with the court, and served on the other party. Serving the papers on the other party needs to follow the rules for process of service, which requires that a person who is at least 18 years old and who is not involved in the case deliver the papers to the other party. You may also hire a process server to do this for you. When you and your spouse or partner have both filled out a Schedule of Assets and Debts, you can compare them with one another and look for discrepancies. If you disagree on the categorization of community or separate property, or if you disagree about the value of something, you will need to work out an agreement or contact a professional for assistance. It is not uncommon to work with lawyers, accountants, or other professionals to determine how to categorize certain things, or to value them. If you choose to work with a well-established lawyer who has experience in property division, he or she will likely have professional contacts on which you can rely for things like valuing your property. Financial mediation is also an option for those couples that want to work together instead of going to court. In this process, you and your spouse or partner can hire a private mediator, who may also be a lawyer, to act as a neutral third party who facilitates a healthy and productive discussion with the goal of reaching an agreement on property division. You can both meet with your mediator separately and as a group until an agreement is reached. Both parties have the option to meet with attorneys separately outside of mediation. Mediation can also be used to create the terms of the rest of your divorce, including things like child custody. 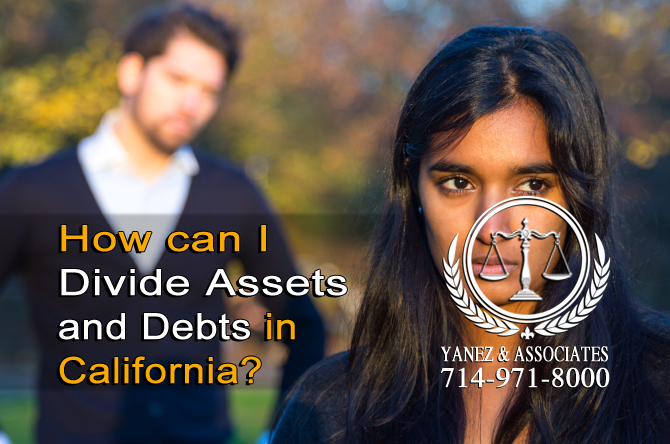 How can I Divide Assets and Debts in California? In some cases, assets and property are used interchangeably when it comes to property division. However, depending on your situation, property may constitute anything that you own that does not earn you income, while assets are things that you own that do earn you income, like a business, or stocks. Assets can be some of the most complex things to value, especially because they have the potential to bring in additional income in the future, which can change depending on the economy and other factors. This can make dividing them fairly difficult. Debts, on the other hand, include anything that is owed at the time of the divorce. They may include credit card debt, mortgages, student loans, or car payments, for example. 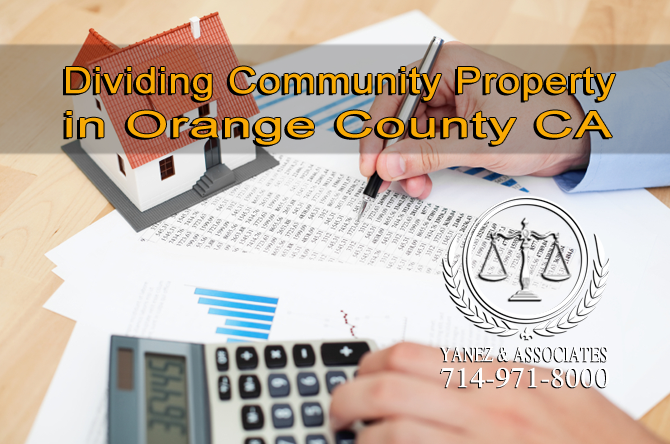 How can an Orange County Property Division Attorney help me with my assets? You may not immediately think that you need an attorney for assistance dividing your property, but it is always a good idea to get a consultation. At Yanez & Associates, we offer free initial consultations, so you have nothing to lose. Try to make a list of your debts, assets, and property including categorizing everything as either community or separate, and adding a value. An attorney can help you understand exactly how the law will apply to your case if you have any questions. Contact the lawyers at Yanez & Associates today to schedule your free consultation. 2.2 How is Community Property Divided in California? 5 How can I Divide Assets and Debts in California? Is My Spouse Entitled to 50 Percent of My Assets in a Divorce in Orange County?